THE HOOK: Are y - what? Did you not just hear me? You get to be Batman! THE WORLD: Batman - the gritty, post-"Killing Joke" version thereof - seemingly brings the Joker to justice, but it's all an elaborate ruse to get him trapped in Arkham Asylum for the Criminally Insane, along with a rogue's gallery of... Well, rogues, really. Batman must not only punch and kick rather a lot, but also use his skills as the World's Greatest Detective to foil The Joker and escape the island. Of course, you'll encounter other heavily-trademarked characters such as Poison Ivy, The Scarecrow and Jader (“JOKER made this biological weapon to jump on BATMAN”... Hang on, wrong game), plus a very conveniently-located second Batcave and all of your favourites - but not Robin - in this return to form for a character whose videogame career was in the doldrums at the time. GAMEPLAY: A bit "Metroidvania", as the kids all say, where exploration leads to gadgets and upgrades that open new areas. 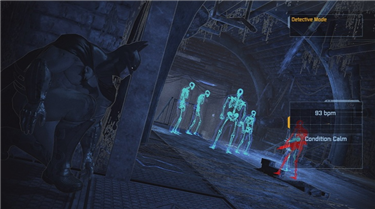 There are three main phases to the game, with unarmed combat featuring a reasonably foolproof flowing engine that makes each broken jaw a joy to mete out, and regular Predator Rooms, where Batman must stay out of sight, ominously swooping on his armed enemies to avoid being shot to pieces, in a number of appropriately moody settings. But the best bits are the exploration; swinging and swooping, clambering and crawling, using Detective Mode to discover the Riddler's clues and pinpoint enemies at distance. This is as close as you're likely to get to being Batman without getting sectioned and convicted of assault and peeping tomism. SERIES: "Arkham Asylum" is game one in a three and a half game core series. Sequel "Arkham City" and its expansion "Harley Quinn's Revenge" greatly expand the playing area and the range of missions, becoming more of an open world game. "Arkham Origins" greatly expands the playing area, but not the range of missions, making up for it with an arguably more compelling storyline. HIGHLIGHTS: There's a lot of different stuff to do. For instance, The Scarecrow uses his fear gas to cause hallucinations. Bad for Batman; good for you, as you get an interesting little minigame to play! Or why not try to foil The Riddler by collecting a load of trophies... Yes, I'm not sure how that one works either, but it provides a giddy little thrill. LOWLIGHTS: Well, the Batmobile's not in it much. Also, quite a few of the bosses or featured fights are almost exactly the same, which can lead to frustration when everything gets a bit same-y. IF YOU LIKE IT: Here's a bit of an off the wall one for you: why not try "Infamous"? It's another morally ambiguous superhero game with an open world and customisable powers, and it isn't half bad either. If you're just in it for the famous names - nothing wrong with that, mind - go for "Lego Batman" or one of the other Lego superhero games. See a younger, more beautiful me tackle the ZX Spectrum's Batman-related output - or at least wait for it to load - over at Talk About The Passion (http://www.tatp.org/blog/?p=3772). And hey, why not stay a while and check out some other bits and bobs? Low light Harley Quinns Voice. A Godawful Small Affair: Twenty-One "Hours..."
A Godawful Small Affair: Twenty "Earthling"